Neeraj Chauhan, born and raised in Delhi, is a 1st generation Delhiete. He is one of two children reared in a middle-class family. He was raised with conservative values and learned the importance of hard work, appreciating what you have, and helping those that stand in need. Neeraj’s education includes a Bachelor’s degree from Shivaji College, Delhi University with a bachelor’s degree in Commerce. He is a Certified Financial Planner® (CFP), AMFI Certified, IRDA license holder, MDRT Life Member and a founder member of BNI Pratham, Gurugram Region. Neeraj has been a passionate Financial Advisor since 1990 and is the Founder and director of The Financial Mall since 1992. 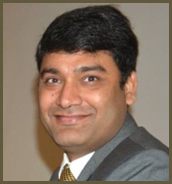 Neeraj has held various leadership roles throughout his career 25+ years. He is a member of the Independent Financial Advisor Association, Network FP, MFRT, and the Million Dollar Round Table (USA). He has been on television, spoken at several National Conferences and has delivered various talks on Financial Wellness. Today Mr. Neeraj Chauhan, CFP is one of the best financial planner in the country with experience of more than two decades. He has helped numerous families to achieve their financial goals. Neeraj knows how to overcome some of the most demanding & uncomfortable financial situations a person can face, He smartly deals with various behavioral issues which hinders with wealth creation & cover most areas of the individual’s financial needs that results in the achievement of individual's smart goals. Using an authentic n unique blend of skills, knowledge and experience, Neeraj is able to equip people with the skills they need to take better control of money and responsibility for their financial future. he passionately provides expert guidance and support on the practical and technical aspects of various money issues. He also intelligently helps people to sort out their unconscious behavior with money so that their personal energies and financial resources can work in harmony to create the life they want to live. Mr. Neeraj was also speaker on Main Platform at MDRT annual Meeting in Orlando, Florida, USA in 2017. where 13,000+ participants attended the annual meeting from all over the world. Neeraj is Regularly invited on Various Money shows in TV channels like ZEE Business, Doordarshan, India News, NDTV etc. His Regular articles, bytes &expert views get published in various magazines and National Newspapers like Economic Times Wealth, Mint, TOI, Deccan chronicle, Hindustan, outlook money etc. Neeraj is regularly invited to conduct Financial awareness programs in various organizations and has conducted programs in institutions of repute like Shriram College of Commerce in Delhi University, BhartiyaVidyaPeeth, Amity University, Guru Govind Singh University, NC Jindal Public School, HDFC Ergo, Guru Nanak Institute of Management, Delhi Institute of Advanced studies, Jindal centre, Rotary Club, LIC of India, and many more. Neeraj has received various award & accolades for his work. Neeraj is also a Life Member of Million Dollar Round Table which is an International and independent Premier association of Finance Professionals having members from more than 430 companies across 78 countries. Neeraj has also served on various committees in MDRT.